Claude, Claude, Claude ... this is long over due, just the mention of his name. During St.Lucia Carnival 2008, Claude was a regular commenter on this site. Soon enough, we were FB and BB friends. And over the four years of our friendship, I consider him to be one of my best, most stylish and creative male friends. We just vibe, bonded over carnival(s). 'Though, we are both fellow St.Lucians, we are yet to meet. Claude's late nights usually consist of costume development and production, while mine are due to insomnia, so he often bounces and shares his creative projects with me. Claude has an idea and delivers. He has taken every idea of his and made it tangible. That is truly admirable and amazing. And in his world that means a year of a well thought out plan, from simple ideas to his money makers. One of those ideas, not only made him a designer, but he is also co-band leader for KARMA Carnival Band in Labor Day, NYC. ... And has taken 3 of his designed costume sections to various bands during St.Lucia Carnival in July and Miami Carnival in October over the last 2 years. With the new name change, he is part of the costume design reenergizing of XS Neo for St.Lucia Carnival 2012. So trust me, I have known from the end of the last Labor Day, the 2012 theme of his band and he constantly updates me via BBM pictures of all his creative developments. Yes, costumes. Along with every other side project which comes along. Amen. Gone are the days when I'd first get that distrusting warning, "Do not share with anyone!" Not only has he trusted me with his business but we rant over carnival issues from here to St.Lucia, to Trinidad and every where in between. Despite my long over due introduction, simply cause he's become 'my best kept creative secret!' ... he has never for an instant been the least bit angry or less forthcoming during our friendship. ... And I respect that! Yet, I can't keep my secret for much longer since Claude is branching out beyond the carnival realm! 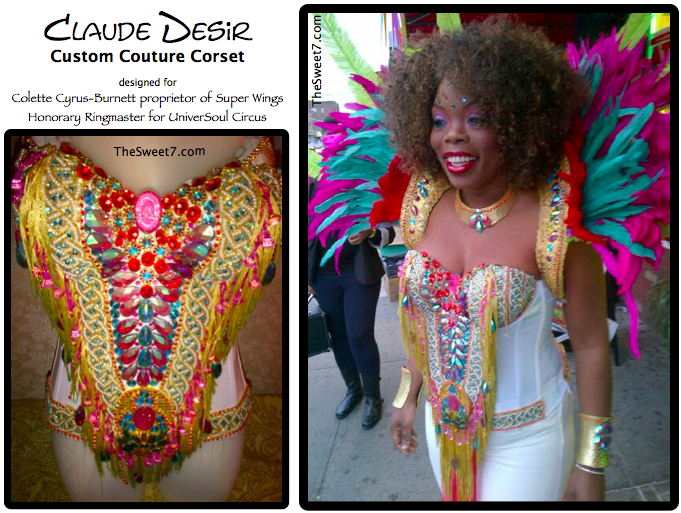 He decorated my Trinidad Carnival 2012 Monday wear and last night Colette Cyrus-Burnett proprietor of Super Wings was the honorary ringmaster for UniverSoul Circus grand opening ceremony wore a 'Claude Customized Couture Corset' ... we joked the 'C4'. Wow! I am truly impressed... 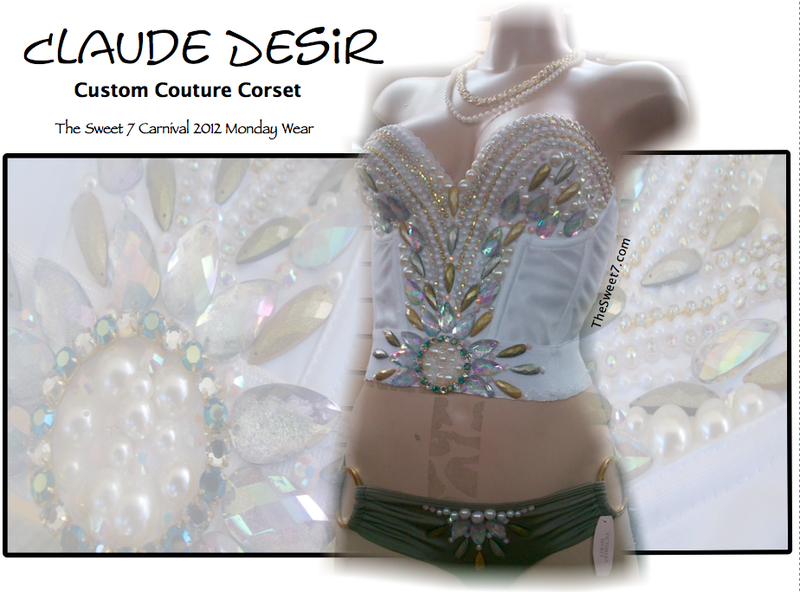 I loved your Monday wear for Trini this year and I am glad you revealed the designer. Claude, I am a fan. Look forward to seeing more of your work this year. Oh Wow!! I want one!! This looks amazing.